The Incredibles 2 trailer: This movie is smashing gender stereotypes. "As a working mum, this is what I noticed in The Incredibles 2 trailer that's great for modern families." The look that greeted me was one of confusion tinged with a sprinkle of judgement, as if I’d said my kids were being babysat by a wolf pack in the African jungle while I binge-drank in Bora Bora. Despite all the progress we’ve made in championing women in the workforce, I run into gender stereotypes everywhere I go – at the park, at kinder drop-off, at work and during random conversations with strangers. We’ve made a lot of progress since Nanna was tied to the stove in a floral apron, but we have a fair way to go. That’s why I was so thrilled to watch the trailer for Disney Pixar’s Incredibles 2. Why do I love it so much? Where do I start? 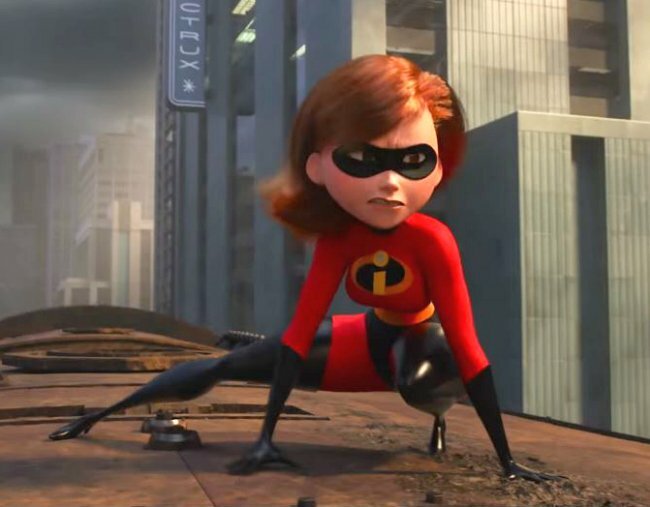 Fourteen years after the original film, the sequel is shaking things up with Elastigirl (aka Helen, the Mum, voiced by Holly Hunter) taking the lead. As the face of the ‘Supers’ campaign, Helen starts a demanding new job while Bob/Mr Incredible (voiced by Craig T. Nelson) has to navigate his way as a stay-at-home dad to Violet, Dash and baby Jack-Jack. The reversal of traditional gender roles doesn’t go too smoothly as Bob deals with a moody adolescent, a fussy eater and a baby with a tendency to self-combust courtesy of his emerging superpowers. In one scene, a fluffy-robed Helen rings from a plush hotel room to check how things are going at home. Bob says “Everything is great” – except everything is most certainly not great. Bob is struggling to understand modern-day homework, his daughter’s mood swings are escalating, he keeps losing the baby, and the kids are eating waffles for dinner. While Bob is developing a new appreciation for the hectic nature of stay-at-home parenthood, Helen is showing her kids that gender shouldn’t limit their career choices. They’re both heroes. My favourite part of the trailer is when Helen says, "I know it’s crazy, right? To help my family, I gotta leave it. To fix the law, I gotta break it." Bob responds with, "You’ve got to, so our kids can have that choice." How profound and refreshing is that for an animated film? Two progressive parents leading by example and showing their kids how to smash glass ceilings. I legit fist-pumped. I love that a family film can be funny and entertaining while also contributing to the current momentum towards gender equality. Kids need to see females taking the lead in the content they consume. They need to know that Mum can achieve whatever she wants, be that staying at home or nailing her career. They need to learn that Dad is just as capable of handling the demands of domestic life, even if it takes him a little while to get used to it. In another scene from the trailer, the kids walk into their new mansion of a house and Dash looks around and says, "Woah, I like Mom&apos;s new job." Despite my husband and I both working our tooshies off, when we go to restaurants the bill is always put in front of him as if his gender automatically translates to a higher bank balance. In Disney Pixar’s Incredibles 2, Mum is earning the big bucks and Dad’s ability to take on a bigger role at home isn’t undermined. For me it’s not just about empowering women to achieve career success, it’s also about empowering dads to spend more time at home. Men are still under immense societal pressure to bring home the bacon, the same way women are under pressure to be the primary care-giver. Mums and dads should feel free to take on whatever roles suit their family without preconceptions and judgement. You do you, boo. Everything about the trailer for Disney Pixar’s Incredibles 2 feels current and relatable. While my kids have never shot laser beams out of their eyes and I wouldn’t be seen dead in lycra, the themes are common for so many families. We’re all finding our feet, we’re all doing our best to raise good people, we’re all trying to navigate the twists and turns that life throws at us. And we don’t always get it right. Modern-day family life can be constricting, liberating, exhausting and joyous all at the same time. It can challenge our ingrained bias and help us grapple our way towards a more equal future. Whether we’re hard at work at home or hard at work at the office, I reckon we’re all pretty incredible. Incredibles 2 is in cinemas June 14. Jacqui McCallum is a regular contributor to Mamamia, a mother of two, and runs her own communications business, Blue Budgie Communications.